It seems to me that the best way to gauge the effect legalization has had on the roadways is to look at what has happened on the roads since legalization took effect. 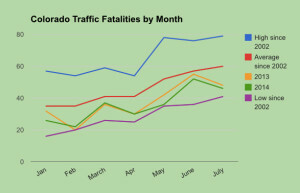 Here’s a month-by-month comparison of highway fatalities in Colorado through the first seven months of this year and last year. 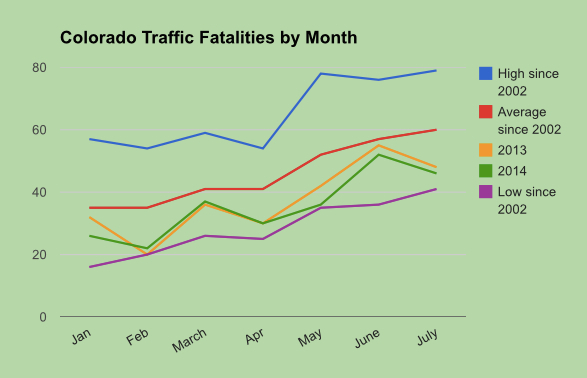 For a more thorough comparison, I’ve also included the highest fatality figures for each month since 2002, the lowest for each month since 2002 and the average for each month since 2002. Here, the “high” bar (pardon the pun) is what you get when you add the worst January since 2002 to the worst February, to the worst March, and so on. The “low” bar is the sum total of the safest January, February, etc., since 2002. What’s notable here is that the totals so far in 2014 are closer to the safest composite year since 2002 than to the average year since 2002. I should also add here that these are total fatalities. If we were to calculate these figures as a rate — say, miles driven per fatality — the drop would be starker, both for this year and since Colorado legalized medical marijuana in 2001. 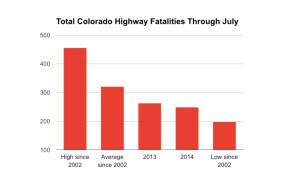 While the number of miles Americans drive annually has leveled off nationally since the mid-2000s, the number of total miles traveled continues to go up in Colorado. If we were to measure by rate, then, the state would be at lows unseen in decades.